Director – Leon Klimovsky, Screenplay – Jacinto Molina & Hans Munkel, Photography – Leopoldo Villaseñor, Music – Anton Garcia Abril, Special Effects – Antonio Molina, Makeup – Juan Luis Morales, Art Direction – Ludwig Orny. Production Company – Plata Films S.A./Hi-Fi Stereo 70 KG..
A detective and a coroner examine the body of the werewolf Waldemar Daninsky. The coroner pulls the silver bullets out of Daninsky’s chest, only to cause him to return to life under the light of the full moon. Elvira and her best friend Genevieve are two French students conducting post-graduate research into the occult – in particular the legend of Countess Wandessa Darvula de Nadasdy, a 15th Century aristocrat who reportedly engaged in Devil worship and became a vampire before being staked with a silver cross. In search of evidence, the two of them head to the remote Village de Chats only to run out of gas. There they meet Waldemar who invites them to stay at his family home and guides them to the grave of Wandessa. 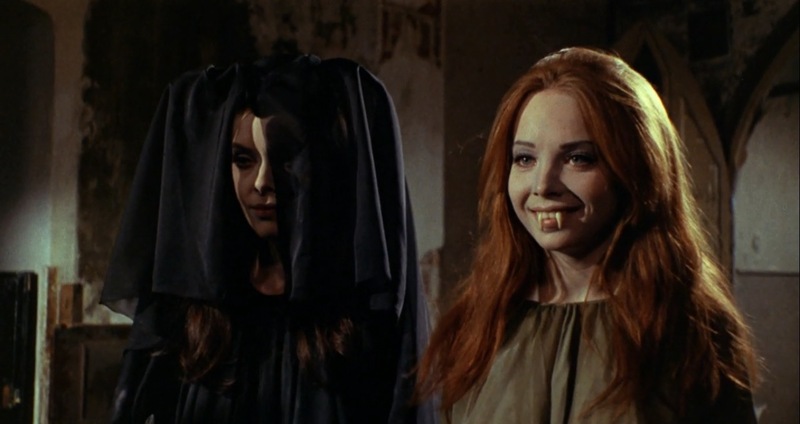 After Elvira removes the cross from the corpse’s chest, Wandessa returns to life and places the vampire bite on Genevieve. As Wandessa claims more victims, the only hope is for Waldemar to fulfil his fated role and become the werewolf again to stop her. Spanish actor Paul Naschy (1934-2009) gained fame as a horror icon during the 1970s after his first appearance in Frankenstein’s Bloody Terror (1968). A lifelong horror fan, Naschy wrote the script for the film under his given name Jacinto Molina. He was then persuaded to take the lead role of the wolfman Waldemar Daninsky where he adopted the pseudonym Paul Naschy to help sell the film to English-language audiences. The wolfman became Naschy’s signature role and he went onto play the part in nine other films (see below for the other Waldemar Daninsky films). Naschy played a number of other iconic horror roles in films such as Jack the Ripper of London (1971), Count Dracula’s Great Love (1972), Horror Rises from the Tomb (1972), The Hunchback of the Morgue (1972) and Vengeance of the Mummy (1973), most of which he also wrote. He also began to direct with Inquisition (1976) and made fifteen films as director, almost all in the horror genre. The Werewolf vs the Vampire Woman – the actual Spanish title translates as The Night of Walpurgis, something that never has much relevance to the film – was a huge success for Naschy. Naschy was always an actor who wanted very much to be a Hammer (or Universal) horror star. It feels as though The Werewolf vs the Vampire Woman was conceived after Hammer announced Countess Dracula (1971), loosely based on the exploits of the notorious Countess Elizabeth Bathory – the two films were released only five months apart. Naschy had had some success with bringing Famous Monsters together in the previous Dracula vs. Frankenstein (1970) thus The Werewolf vs the Vampire Woman has been imagined akin to another Universal monster bash a la Frankenstein Meets the Wolf Man (1943) with Daninsky meeting Countess Bathory. Here she is renamed Countess Nadasdy (which was Elizabeth Bathory’s married name), while the script freely embellishes many of the historical details, including having her involved in Devil worship practices – this was not long after the spate of occult and Devil worship films sparked by the success of Rosemary’s Baby (1968) – being prosecuted by The Inquisition and killed with a silver cross (as opposed to bricked up alive as she was in real life). The huge disappointment of the film is that it sets up a great title fight and then squanders the opportunity. For all its promised title match, the script does almost nothing to establish the rivalry and enmity between the two of them or give much reason for their fated confrontation. Leon Klimovsky’s direction is not the best either. The film slows down as soon as it reaches the house – there is the odd scene of the mad sister tapping at the window, the countess appearing in slow motion and mist, and a couple of appearances of a zombie priest but not that much happens. The climactic showdown between Daninsky and the countess is disappointingly routine. As the countess, Patty Shepard (here billed as Paty Shepard), later to become a mainstay of Spanish horror and other Naschy films, is criminally not allowed to get up to much. She exudes almost no presence in the film. The plot is the usual shabby affair slung together for Naschy’s films – Gaby Fuchs’ best friend Barbara Capell is vampirised by the countess but Fuchs’ character seems to display almost no reaction to what happens. Paul Naschy played Waldemar Daninsky in ten films:- Frankenstein’s Bloody Terror (1968), Dracula vs. Frankenstein (1970), this, Dr Jekyll and the Werewolf (1972), Fury of the Wolfman (1972), Curse of the Devil (1973), Night of the Howling Beast (1975), Return of the Wolfman/The Craving (1980), The Beast and the Magic Sword (1983) and Licanthropus (1996)..